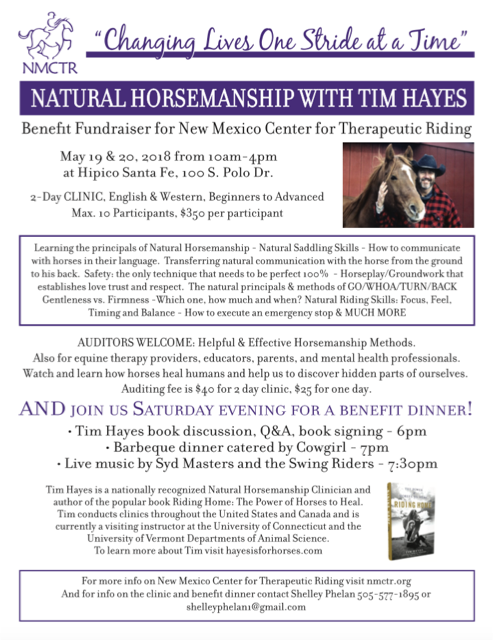 Learning the principles of Natural Horsemanship – Natural Saddling Skills – How to communicate with horses in their language. Transferring natural communication with the horse from the ground to his back. Safety: the only technique that needs to be perfect 100% – Horseplay/Groundwork that establishes love, trust, and respect. The natural principals and methods of GO/WHOA/TURN/BACK – Gentleness vs. Firmness – Which one, how much, and when? Natural Riding Skills: Focus, Feel, Timing and Balance – How to execute emergency stop & MUCH MORE. Also for equine therapy providers, educators, parents, and mental health professionals. Watch and learn how horses heal humans and help us to discover hidden parts of ourselves. Auditing fee is $40 for 2 day clinic, $25 for one day.